Geographically, South America refers to the territory located roughly between 12.5 degrees north and 56 degrees south latitude, and 34.5 east and 81.5 degrees west longitude, corresponding to the nations located southeast of Panama: Colombia, Venezuela, Guyana, Suriname, Brazil, Ecuador, Peru, Bolivia, Paraguay, Chile, Argentina, and Uruguay. Physically it is bordered by the Caribbean Sea and the Atlantic and Pacific Oceans. 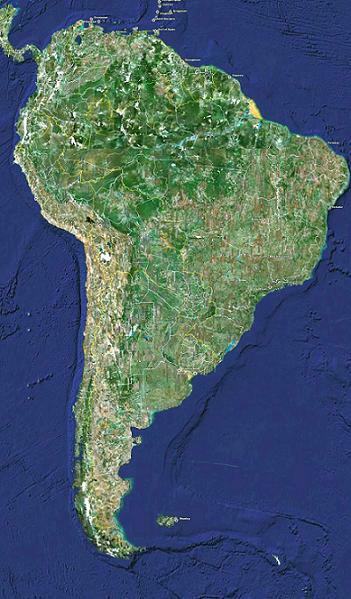 Internally it is divided by the Andean highlands in the west, the tropical northern lowlands and the Guiana Shield, the Amazon rainforest in the center, and the relatively drier southern cone. The northern Caribbean States of Venezuela, Guyana, Suriname, and parts of Colombia and Brazil are isolated from the rest of the region by a vast series of wetlands and rainforest while the countries of the more populous western portions of Ecuador, Peru, Bolivia, Chile, and Colombia are isolated on the western Pacific coast by the Andes Mountains, the longest and second highest mountain chain in the world. Finally, the territory located south of the Amazon and east of the Andes encompasses some of the most fertile land on the planet and the majority of Brazil’s population and all of Paraguay’s, Argentina’s, and Uruguay’s. On a smaller scale, most countries in the region are further subdivided by bisecting mountain chains, rainforests, or deserts that act as internal barriers to trade and communication. These geographic divisions are often able to transform themselves into internal barriers to economic and political development. Internal political divisions are more pronounced in the Andes due to the distances between the coast and sierra but are also present in other countries due to the vast distances and relatively poor physical integration between urban centers and rural provinces. Manifestations of the effect of this geo-political division include the formation of rival political factions like that of the Revolutionary Armed Forces of Colombia (FARC), the historic political rivalries between Guayaquil and Quito, the Peruvian highlands demands for more autonomy and funding from Lima, the Bolivian lowlands ongoing disputes with the central government in the highlands of La Paz, and the poverty and relative underdevelopment of the north western interior of Brazil. These historical disputes over the locus of power and access to state resources have played a very influential role in the resulting power dynamics in each of these nations and continue to influence the direction of the current integration process.